I live near you so no, but I won’t eat beef outside of Nebraska. It’s (to me) awful even when they say it’s good. Oh, good point. We ARE spoiled with our beef here! This dish sounds delicious, Laura! I won’t make it (my husband HATES fish, and asparagus, and I’m not about to make two different dinners), but it sounds delicious!!!! Everything I’ve ever made of yours has been perfection, so I know anyone who is lucky enough to have a fish-loving spouse will love this! Check out Costco for salmon too. I used to get it from there, before we got married. Salmon is one of my favorite things. I can get fresh salmon, but it usually has the skin on it. I wonder how that would affect the taste of the vegetables. Would they taste fishy? It’s much easier to remove the skin after the fish is cooked than before, and the skin can help retain moisture. When I roast veggies, I put them in the pan next to the fish and drizzle the oil/spices on, cooking them next to each other. No fish taste and it’s easy to remove the skin. Cooking time is still the same. I like Jill’s idea of roasting the asparagus separately to avoid the fishy taste! I live in Wisconsin, which borders Lake Michigan. Fish fries and fish boils are very much a part of our culture here. Salmon, however, is not a lake fish so I have to be very thoughtful when purchasing it. Wild salmon is better than farmed, in terms of being safer to eat. I cook my salmon skin side down (and lift the fish right off the skin to serve). I like making a mix of bread crumbs, shredded Parmesan, and Italian seasoning to bread the salmon with after dipping in an egg wash. Yum! I live in the desert, but grew up by the sea, so we love salmon, but most often it is frozen or canned. This recipe looks great, but those are salmon fillets, not patties (which are made from small pieces, ie. canned salmon) I have a wonderful salmon patty recipe if you would like it. Would love a (canned) salmon patty recipe. Something my momloves. Frozen is good, just find out where it originally swam, you do not want fish from China or Taiwan? ?? It’s really bad I think it will be on the label. I will try your recipe, it sounds delicious and so simple. I’ve been using a mix of my own that includes warmed honey, juice from lemon, garlic, and low sodium soy sauce. Drizzle over top and bake. Done in about 10 minutes. Excellent. I’ve been getting THE BEST wild Alaskan Sockeye Salmon for years from a company called Vital Choice. It has been recommended and praised as the best by many doctors and health experts for years too. But I can tell you from my experience it is truly the best Salmon I have ever tasted. They also guarantee everything you buy. They stand behind their products 100%. It is that good. Delivered to your door packed in dry ice. You can get it no skin no bones or with skin, whole fillets or 4 or 6 oz portions. Spend $99 and it’s free shipping. I hate to sound like a commercial but I highly recommend Vital Choice every chance I get. Oh, and I can also vouch for their canned salmon, and tuna. The canned is not like any other canned salmon you have ever tried. I do not care for the pouched salmon (in pouches) but the canned is excellent! Wow, I am definitely going to check this out! We use canned salmon for our pasta night. I add it to pasta and add in mayo, celery, onion, season it real well and then add diced mozzarella or cheddar. Store it in the fridge and let it chill. I could eat it every day! Also, here is another easy recipe. we like for fish from this website. I usually pour this in a 9×13 pan and bake it the same amount of time. It makes it quicker for my family. Mix all of the ingredients and spoon into 12 well-greased muffin cups. Bake at 350º for 30 minutes until puffed, set and lightly browned around the edges. We serve it with her easy tartar sauce or chipotle mayo. Yum! Thanks for sharing it sounds like a great high protein lunch! Well, I do live near a great, big ocean, but the problem is I’m not a native New Englander, so I never grew up loving seafood. I came from Canada in the Niagara region, and although I was surrounded by great, big lakes, it’s not a huge fish-eating region. So after twenty-seven years of marriage and living on the East Coast, I’m still finding ways to cook and enjoy seafood. I know that we should eat more, too, but it’s not the cheapest meat for your budget. I’ve made a similar recipe with salmon and asparagus in foil packets. I also mostly rely on frozen (but don’t tell all my New England family and friends! ), because it’s convenient, usually more cost-effective, and I seem to be able to find/afford the wild caught, which from my understanding, is a healthier option. You’re so right about it being pricey. I wish it wasn’t since it’s so good for us! Don’t hate me…I live in Florida and have easy access to LOTS of fresh fish. Only problem is husband and youngest daughter don’t like fish. ???? Husband doesn’t like the smell either, so I don’t tend to cook it at home. Love to order fish when we go out to eat though! Aww, at least you get the good stuff when you go out – and you don’t have to cook it! I have had great luck ordering salmon from Zaycon! But it’s only available once or twice a year so I stock up! I also have to drive over an hr. to even find a decent restaurant that sells good fish and that is O’CHARLIES…..they have the best fish I’ve eaten in about 8 yrs….Could always find good fish in Mich. but not here….without driving a long ways…. Laura, do you have a WHOLE FOODS store ? They sell fish fish, most any kind you would want……I just shy away from buying fish in these supermarkets !!! But have seen different places online where you can buy fresh sea food…..most all kinds of fish, etc….quite expensive tho, so I never tried it….I eat canned salmon, tuna and then when I eat out if I can get fish, I usually do…..
A friend sent me some info re:buying fish, seems most of the fish caught by big companies ship it to china to process and send back to them…..one reason it is so expensive….and they say china’s facilities where t’s processed is absolutely filthy…..so that is a turn off for me…. I contacted a fishing company who catches the fish and it is processed on their large ships and sent straight to the stores for purchase….they do not send it to china…..workers live on the ship and they have people who do the fishing and the other employees do the processing…..amazing article I read…..at the moment I have misplaced my info, but did keep it, I will keep looking for it……and they used to send me weekly emails on their business….if you take the time to email them, they will answer…..just sayin …..
CORRECTION…. 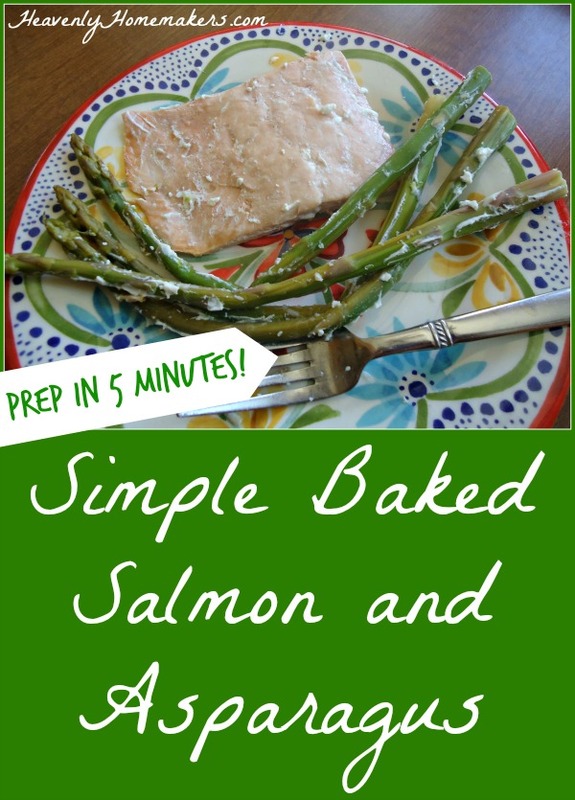 in my message, I said fish fish, should have been fresh fish…..sorry…..
We love salmon and asparagus here, so I’ll have to give this recipe a try! I’ve been happy with the frozen, wild caught, red sockeye salmon fillets I purchase at Trader Joe’s. I find the price reasonable at $9.99/lb. My favorite way to cook it is in a cast iron skillet, in a mixture of butter and olive oil. Season the salmon well with salt and pepper, and sauté it up in the skillet (both sides). So simple, so fast, and so yummy!!! I too can vouch for the excellent quality of Vital Choice seafood! I’ve never bought the salmon fillets, but have purchased canned salmon, canned tuna, king crab legs, clams and mussels. They are very pricey, but the quality is truly outstanding! For a special occasion, I will splurge once a year or so. I second the trader joe’ wild caught salmon. Honestly, if one doesn’t live near the ocean, frozen wild caught sustainable fish is probably your best bet. Most wild caught salmon is flash frozen on the boats within hours of being caught. Fish in meat cases far from oceans is often defrosted once frozen fish and may contain chemicals injected to plump up the fish. That being said, there is only so much wild fish on the earth and consumers should buy/eat fish in a sustainable manner as well.